Since 1973, the Festival of Native Arts has provided cultural education and sharing through traditional Native dance, music, and arts. 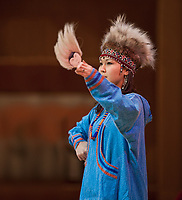 The Festival unites the major Native culture groups from across Alaska, as well as foreign groups of the continental United States and countries such as Japan, Russia, and Canada. next » | 225 sample images from this category. Try a keyword search to see them all. 2017 Festival of Native Arts celebration in Fairbanks, Alaska.